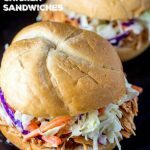 Busy nights don't have to equal pizza or fast food - with 15 min, and just a little planning, you can have these yummy slow-cooker BBQ chicken sandwiches! Place chicken in slow-cooker. In a medium sized bowl, mix together the ketchup, liquid smoke, vinegar, and brown sugar. Pour the sauce over the chicken. Cook chicken and sauce on low for 6-8 hours or on high for 3-4 hours. Remove chicken to a plate or low sided bowl and shred with two forks. Return chicken to slow-cooker and stir into the sauce. Broil or toast buns lightly and in a separate bowl, combine the coleslaw with dressing. Lay one half of the toasted hamburger bun on a plate and using a slotted spoon, remove some of the chicken and top the bun with it, followed by 1-2 tablespoons of coleslaw and cover with the top bun. Serve with fries, tater tots for the real quick and easy. Or if you're feeling more fancy, serve some macaroni and cheese and green beans alongside the bbq chicken sandwiches.